My last update in this batch is for Color Throwdown challenge #98. I’ve only been doing these challenges for the last few weeks, and I’ve enjoyed them! I’ve read that they’re planning a big celebration in a few weeks for their 100th challenge on July 7! Click here to visit the Color Throwdown for more details! 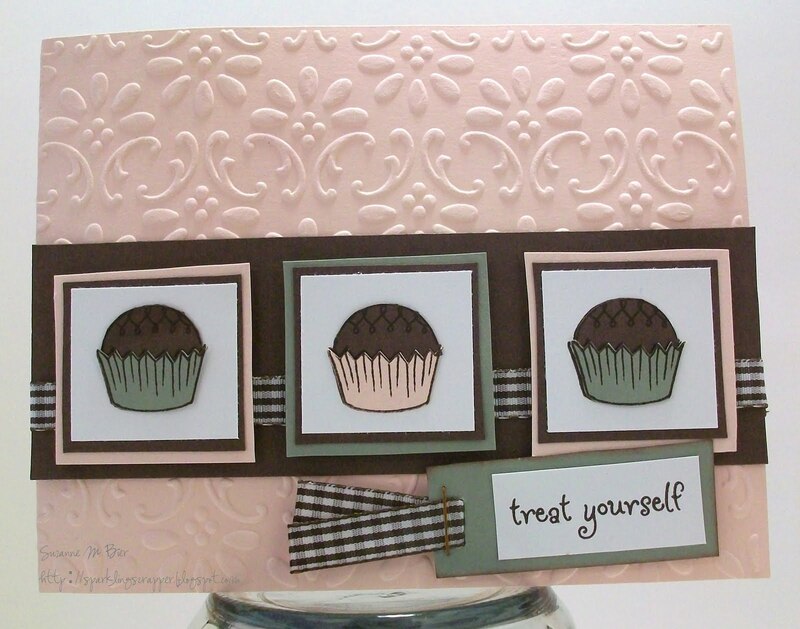 The colors reminded me of ice cream, so I went with a similar idea and used these stamps from Elzybells Art Stamps. I stamped the chocolates twice in Chocolate Chip ink; once for the chocolate piece and another time for the wrappers. The sentiment is from the same set, and the ribbon is from Making Memories. I embossed the card base with the Big Shot. YUMMY! What a sweet creation! Thanks for sharing and for using the CTD colors this week! VERY cute! LOVE that embossed background! Thanks for joining us for the Color Throwdown, and for the mention of the big celebration coming up! Fun card–I love this! Thanks for playing the Throwdown! LOVE that embossed BG! Yummy interpretation of the throwdown colors!